The bowls of warm grains that sustained Olde England have been inspiring American chefs morning, noon and night. The bowls of warm grains that sustained Olde England have been inspiring American chefs morning, noon and night. Here, some of the best places around the country to get your porridge on. When he added porridge to the menu at Alta, San Francisco­-based chef Yoni Levy was inspired by his grandparents, who grew up eating the Eastern European cereal kasha. His version uses cracked wheat with hen of the woods mushrooms, radishes and baby turnips, but it's a universal dish: "So many cultures have porridge [variations]," Levy notes. It's also a great way to combine a variety of ingredients: as he says, "I love the balance of different textures and flavors all mixed into one pot or plate." altaca.co. At the Nordic-inspired restaurant ACME in New York City, chef Mads Refslund created his beer and bread dessert as a riff on a typical Danish breakfast dish: leftover rye bread was traditionally soaked in beer overnight and stirred with milk the morning for an inexpensive take on porridge. Refslund follows the general idea, but adds white chocolate foam and salted caramel ice cream to sweeten the dish. acmenyc.com. 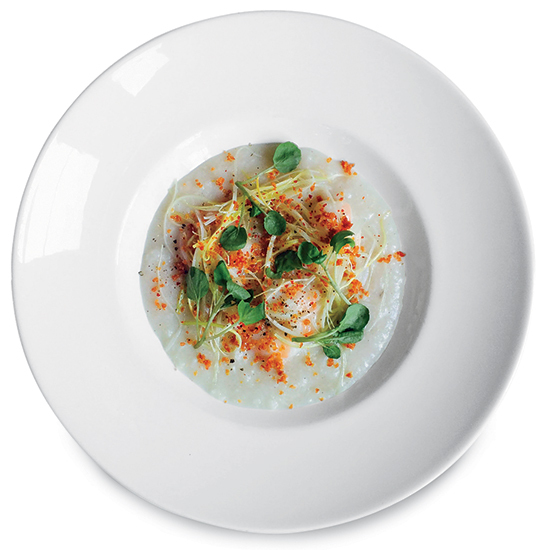 Chef Justin Deviller looked to typical New Orleans dishes when creating the popcorn rice porridge at La Petite Grocery. His rendition was inspired by bouillabaisse and gumbo, but instead of relying on heavy sauces for flavor, Devillier uses aromatic Louisiana popcorn rice cooked with charred ginger and star anise, then topped with fish-sauce spiked poached shrimp, wilted leeks and country ham. lapetitegrocery.com. Though many chefs grew up eating hot cereal, chefs Mark Gaier and Clark Frasier of M.C. Spiedo Ristorante & Bar in Boston looked a little farther back in time when searching for inspiration for their wheat berry porridge: specifically, to the Rennaissance. They found a recipe including wild boar in Le Menagier de Paris, a 1393 women's guidebook, but were inspired to update the dish for the modern day with smoked bacon, meat broth, poached egg and ginger. mcspiedoboston.com. At LA's Sycamore Kitchen, chefs and co-owners Karen and Quinn Hatfield wanted to have a breakfast dish that was healthy, but still unique: they came with a barley, quinoa and oatmeal porridge with date butter. Though Karen "grew up eating everything from oatmeal to cream of wheat," their version is a little more complicated than your average microwavable Quaker's: each grain is par-boiled separately before being combined to finish cooking, then heated, cinnamon-spiced dates are puréed served on top of the porridge. thesycamorekitchen.com. Inspired by kasha, chef Yoni Levy tops cracked wheat with hen-of-the-woods mushrooms and turnips at Alta CA. At La Petite Grocery, chef Justin Devillier’s rice porridge with shrimp and country ham riffs on gumbo. —With research by Stacy Adimando.